When my son recently did the wash to earn pocket money, I quickly realized he had no idea whatsoever how to sort laundry. Not only did he just toss everything into the machine, but he also tossed it all into ONE load. Then he added most of a container of my homemade laundry detergent. Now, I’m not the type of person to turn down free (or reasonably priced) help. So, once we’d pried out the clothes he’d jammed into the machine and mopped the laundry room floor, I set about teaching him how to sort laundry my way. Notice, I said my way. 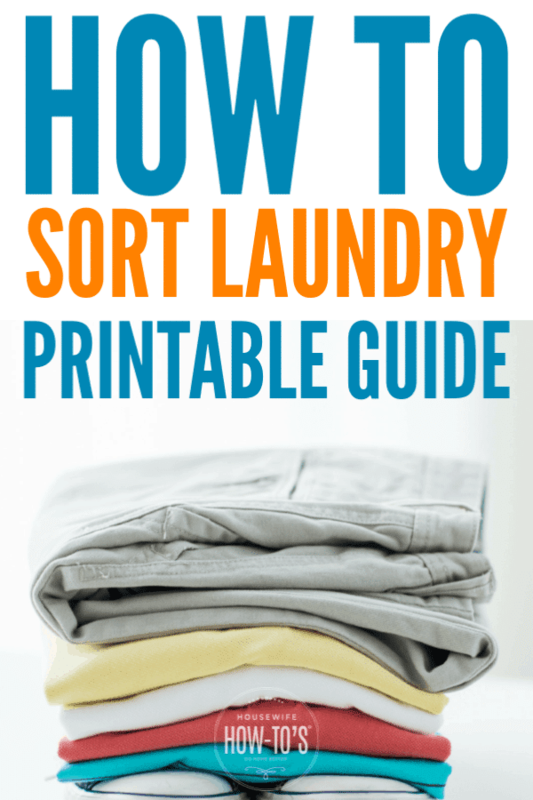 There are all sorts of thoughts about how to sort laundry. Some people do as my son did — throwing clothes, sheets, and towels into the machine willy-nilly. They rely on a cold water wash, and maybe those color catcher things to keep fabric dyes from bleeding. Other people, like my mother, sort so thoroughly that they wind up washing small loads consisting of maybe two t-shirts in the same shade of yellow. That drives me nuts, too. • Get clothes as clean as possible. • Keep clothes from ruining each other through bleeding dyes or friction. • Save time and money if I can. Accomplishing this means that I do sort laundry more than once. 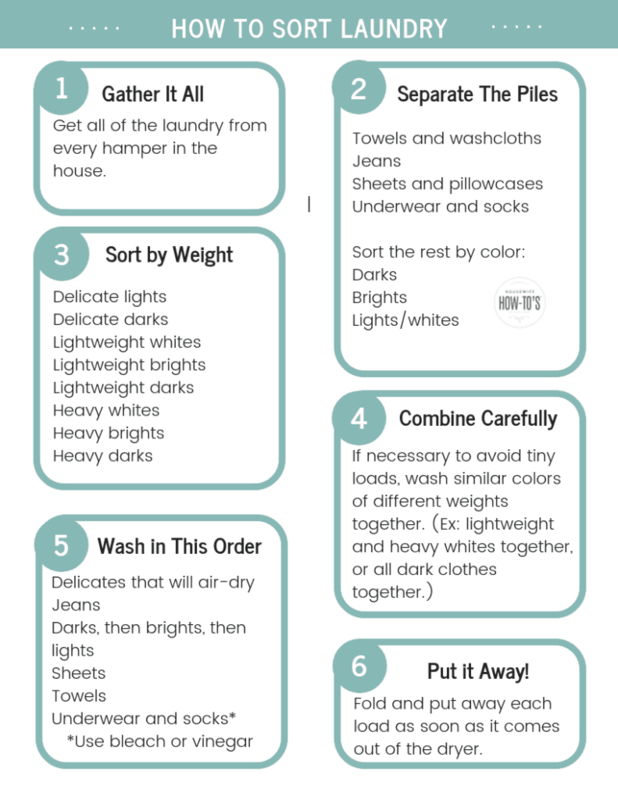 Yes, that’s right: as much as I usually hate repeating steps when it comes to household chores, I sometimes sort then re-sort when it comes to laundry. 1. First, sort clothes based on color. Sort dark clothing from brights, lights, and whites. Sheets and towels get done in separate loads. Underwear and socks go into the same pile. 2. Next, sort the color-categories based on weight. Keep jeans from fading by washing them in a separate load. T-shirts and tank tops are typically made from the same fabric, so they wind up in their own piles (dark, bright, and light). 3. Then combine loads where possible. You can often wash dark and bright clothes together IF they’re the same weight and you’re using the same temp, provided nothing is brand new (and thus likely to bleed dye). Ditto for light and white clothing. 4. Wash the most urgent load first. 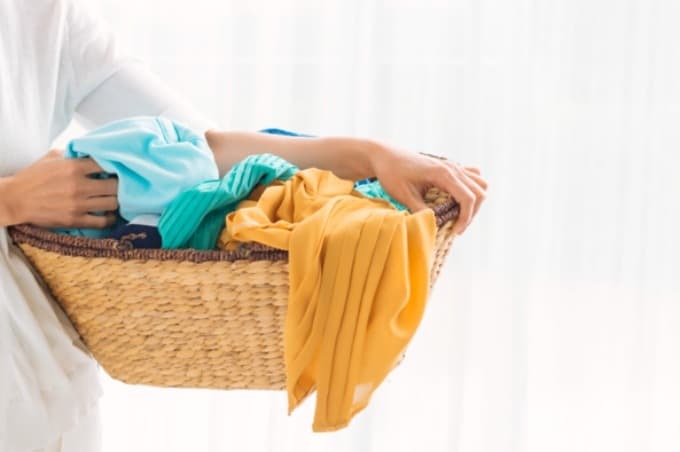 It’s smart to start the laundry by washing the most urgent load first. In our house, that means pajamas because we basically wear them every moment we’re home. 5. Finish with underwear and socks. Washing your dirtiest load last lets you disinfect the machine by adding bleach or white vinegar to the load. When I explained these steps to my son (as I’ve explained it to my husband more times than I can count over the past 15 years), he looked at me like I’d just sprouted a second head. Then I sat down and put together a chart which immediately made sense to him. And the result? He did two loads of laundry yesterday evening and plans to do another two this evening. Not bad for a $5 allowance. Note: This post first appeared on May 1, 2013. It has been revised and the guide updated for republication. I have a pink tee shirt that was washed with blue jeans. I have three lines from it bleeding. How can I get it out? Thanks. Try dabbing at those lines with rubbing (isopropyl) alcohol using this method for removing ink stains. Good luck! My regular clothes washing routine is much more relaxed. If the clothes aren’t going to bleed on other clothes and they can be washed at the same temperature, they can be washed together at my house. Oh you really need to make a chart! Think about it — when family visits, they’d probably love to help you out. With a chart, you let someone else wash those diapers for you. What a great break!